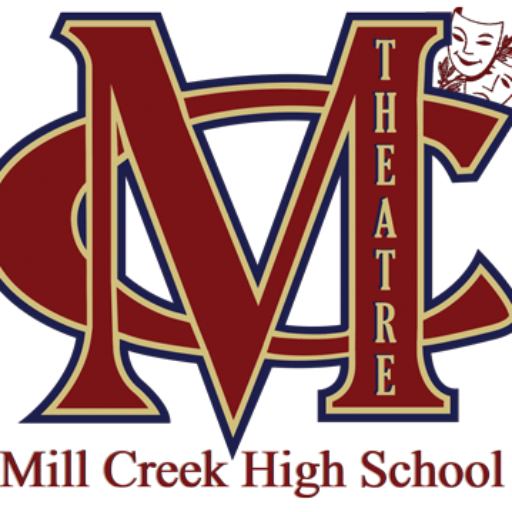 Mill Creek High School Theatre (Troupe 6855) provides experiences and opportunities to participate in live theatre for students enrolled in the drama department at Mill Creek High School. We have a commitment to showcasing student talent in live theatre productions thus providing students with the opportunity to perform and learn about multiple facets of theatre production. In an effort to support the arts and bring them to as wide an audience as possible, we strive to bring professional-level theatrical productions to the community using student talent, assisted and supported by experienced, caring adults. Mill Creek Encore Alliance is an organization consisting of parents, students, teachers and community members supporting the theatre department of Mill Creek High School with funding, marketing and volunteer staffing for all productions. The Mill Creek Encore Alliance is a Public Charity exempt under section 501(c)(3) of the Internal Revenue Code. Contributions to the Alliance are deductible under section 170 of the Code. Tax-deductible bequests, devises, transfers or gifts to the organization are also qualified under section 2055, 2106 or 2522 of the Code. The Mill Creek Encore Alliance exists to lend all possible support, both moral and financial, to the general theatre program of Mill Creek High School. This organization shall foster an enthusiasm and interest in the various activities of the Theatre Department, communicate and cooperate with those in leadership roles within the Department and with all members of the alliance, and assure a continuity of administration of the booster organization from year to year, thus allowing the faculty, staff and students of the MCHS theatre program to draw upon the various services the organization can provide. Further, the MCEA shall endeavor to foster the further education of certain students who seek to pursue theatre as a career choice by way of providing financial scholarships and other opportunities to develop their skills as actors, technicians, writers and directors. Membership: General membership is open to all adults, with a maximum of two per family, interested in the purpose of MCEA. A general member is defined as an adult parent or guardian of a present or future student participating in a minimum of one theatre class or as a cast member of open audition shows within the current season. To contact the MCEA, email us at mchs_drama@yahoo.com . We are thrilled that your child has elected to participate in theatre this year. Unlike most extra-curricular activities, theatre is both a scholastic endeavor as well as a performance endeavor. And it takes money – lots of money – to stage the caliber of performances for which MCHS Theatre is quickly gaining a reputation. Most extra-curricular activities come with a heavy price tag – some well over $500. The Mill Creek Encore Alliance works diligently to raise support through the sale of advertising, sponsorship of activities (like Mill Creek’s Got Talent) and fundraisers. But that isn’t enough. Not only do we stage the productions but students receive tee shirts, make-up kits, and supplies as well as participate in productions. So we require students to pay a set fee (which we call Booster Fees) to help finance their participation in theatre. How much are the fees and what do they cover? 1st Period: $100.00 – Goes toward costs associated with the co-curricular production plays which will be performed after school hours, and Show tee-shirt and includes a make-up kit. *This fee must be paid in order for a student to audition for the spring musical, or attend the end-of-year-banquet or graduate (if this is their senior year.) It is part of the agreement you sign for your student to participate in one of these advanced theatre classes. How can you offset the cost of these fees? Booster fees are invoiced at the beginning of the school year and can be paid online or by check or…and this is important…parents and/or students can sell program (and web) advertising to go toward the expense of their fees. Accounts are credited 50 cents for every dollar of advertising sold. All it takes to cover Period 1 fees is the sale of $100 in advertising – and all it takes to cover Period 6 or 7 fees in full is the sale of $500 in advertising or sponsorships. Even if you don’t sell enough to cover all of your fees, the amount due is reduced by 50 cents for every dollar in advertising or sponsorships that you do sell. For more info or to request an advertising contract form, email mchs_drama@yahoo.com. There are several fundraising opportunities throughout the year to help mitigate the class, musical and ThesCon fees. Please enquire at mailto:mchs_drama@yahoo.com. In addition, we offer the option to solicit ads for our show programs. Any ad funds generated will be split between the student’s account and the MCEA. Ad to appear in all programs of all performances of our class shows, Spring Musical and Competition Play. In addition, the logo is placed on www.millcreektheatre.com with a link to the organization website. Use this form to submit an ad. Thespian Dues: $50. Payable one-time when the student qualifies to become a member of the Georgia Thespian Society. 2019 Musical Fee: $100. The Spring Musical is open to all students at Mill Creek High School. All participating students must pay to go toward the costs of production and includes one (1) production tee-shirt. Georgia Thespian Conference (ThesCon). $230 (2019 Trip). Thespian students can elect to attend ThesCon, a three-day event held in Columbus GA, usually in February of each year which features numerous productions presented by high schools from throughout the state. Plus, students participate in a variety of workshops led by theatre professionals from around the country and can perform or view individual performance and tech events, audition for scholarships, talk to college representatives from around the country, shop with commercial vendors selling theatre merchandise, and hang out with 4,500 other Georgia Thespians. Troupe 6855! 2019 Conference is scheduled for February 7-9, 2019. For more information, visit the Georgia Thespians website… gathespians.org . All attendees must complete the Conference Agreement… 2019 Conference Agreement . 2018: Ticket prices are $40 before May 4th, $50 after, for parents and students who are not in 6th or 7th period. All drama students and participants in the Spring Musical, along with their parents, are invited to attend the end of year banquet. So, who needs to purchase a ticket if they want to attend? All 1st period students, Millie Cast Members and any parent/guardian. Only 6th and 7th period students with fully paid dues do not need to pay for a banquet ticket. One student ticket is included in their dues. 2019 Theatre Banquet will be held on May 18th. Every year MCEA awards a scholarship to a worthy theatre student continuing his or her education in the theatre arts. For more information, click here. Note: Scholarship is contingent on budget constraints. The Mill Creek Encore Alliance board and members meet monthly during the school year. All parents and guardians are invited to attend. We typically meet on the first Tuesday of every month at 6:30 pm in the area near Mrs. Lindahl’s office. To get to charms, go to https://www.charmsoffice.com. If you have any problems accessing your charms account, please contact a board member at mchs_drama@yahoo.com. Purchase tickets for all of our shows and events at Ludus.